Blockchain Technology – the golden bit that helped Satoshi Nakamoto bring Bitcoins to the world. Blockchain Technology, as we know today, was invented to solve the double spending problems associated with cryptocurrency. However, the technology has evolved far greater than that today and enables the entrepreneurs to build businesses more quickly and more efficiently. The massive opportunity in blockchain is growing every single day and in the next five years, we can see a number of critical innovations from it. 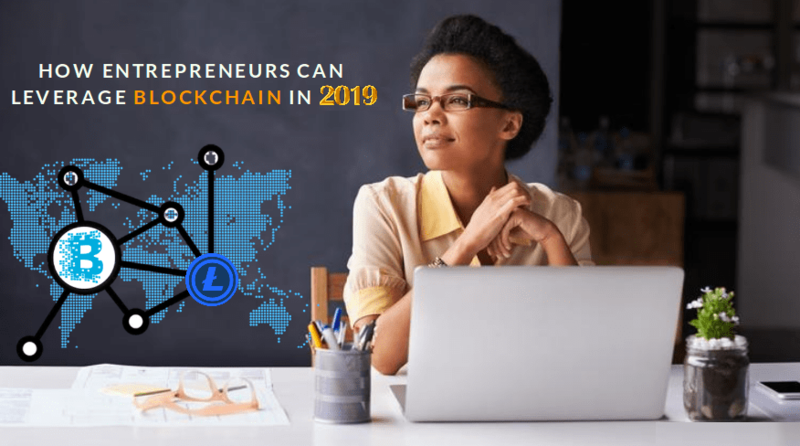 Here, we shall see some of the ways to leverage blockchain in 2019 and how it will transform the business world. If you have ever worked in the Human Resources department of a firm, you would know how much tedious it is to recruit a new employee. You will have to call up each and every previous employer and verify whether that candidate has worked for them or not. In this scenario, blockchain can be used to verify the employment history of potential job candidates. This would be very much similar to how Twitter verifies the accounts of famous people on the microblogging platform and adds a blue tick mark to verify the accounts. Similarly, companies like LinkedIn can make use of blockchain technology to verify employment. Instead of the HR department from every company calling previous employers to verify the candidate’s employment history, blockchain can be used to verify facts like employment start and end dates, title, and job responsibilities. It seems like quite a simple technological change but this can save countless hours and a fail-proof way of checking whether what a candidate has claimed on their résumé is true or false. Moreover, since blockchain is decentralized, there is no way in which anyone can tamper the data. Many companies are going on to adopt blockchain applications to simplify the day to day functioning of the businesses. Blockchains can enable these companies to execute contracts in a fully automatic manner and eliminate the need of third parties to ensure the proper execution of the terms and conditions of the contracts. Such self-executing contracts based on blockchain technology is called smart contracts. We can consider smart contracts as the most feasible ways to leverage blockchain in 2019. When we use a smart contract for a business deal, the terms, rules, and regulations are coded into the blockchain. The system sees if these are executed and then goes on to proceed with the payment. There is absolutely no room for mistakes and no need of anyone to ensure that the terms and conditions are met. The lack of human intervention at any level, except for the coding part ensures that no errors occur in the process. The only error we can expect to happen is the human error that occurs during coding. Another potential industry where blockchain can find a strong foothold is the supply chain industry. Blockchain Technology allows the users to track all the activities and transactions in a secure and transparent manner. This feature of blockchain technology opens doors for endless opportunities in the supply chain management industry. In the course of a product being shipped from seller to the customer, the product shifts hands and every time this happens, the transaction has to be documented. If this is done in a blockchain, then we can create the permanent history of a product right from manufacture to sale. This can reduce any potential delay in time and added costs and human errors to a major extent. Some big shot supply chain management companies have already adopted this technology and experts portray the adoption of blockchain technology as an operating system in supply chain management on a universal scale in the coming years. Entrepreneurs with great ideas are often forced to shelve them due to the lack of funds to get the project running. In many countries around the world, except for the United States, these young entrepreneurs do not have the access to the modern financing sources and fundraising mechanisms to help them raise funding for their budding companies in an efficient and reliable manner. Many of the leading mechanisms in most parts of the world are not suitable for small and growing businesses. The costs associated with acquiring traditional loans are loaded with incremental fees and minimum deposit restrictions. All this force the entrepreneurs to quit the business idea, just due to the lack of funds. Blockchain technology will allow any entrepreneur to acquire funds from investors around the world. Initial Coin Offerings is one of the blockchain business ideas to source funds for your business. You just need to present an idea on a white paper, sell tokens for money and use this money to get your business on the wheels. The tokens are developed through ERC20 token development. Once your project is successful, the value of the token increases and the investors can sell it for much higher worth than it was created. Startups are quick in their working mechanism and function swiftly and solve problems as fast as possible. In the course of building a company from scratch, you will have to allocate a lot of time and resources for the fundraising process. While raising sufficient money at the right time and from the right sources is extremely important and critical to your growth, it does take most of your time away from your involvement in other core aspects of your business. In fact, raising money by traditional means through banks and other financial institutions can take a lot of time. It takes many months of meetings, travel, and email and follows up back and forth before anything is finalized. Using a blockchain which is a decentralized and self-verifying system, firms can transfer funds in as little as five minutes after making up their decision to invest in your projects. This will speed up the entire process of raising funding and reduce the amount of time in the fundraising funnel. For past years, entrepreneurs around the world have been approaching their problems in the same old way. Centralized models of management have been used to tackle the management issues of the business. Blockchain Technology brings forth an entirely new way to control the access of information, which can, in turn, open up a whole array of new opportunities for these businesses. Supply chain management industry can make use of this decentralized platform to optimize the freight, logistics, and shipping of goods. Ethereum based smart contracts can be used to eliminate the need of freight brokers who charge exorbitant prices. Smart contracts use the blockchain technology to automatically track and verify each stage of the complex shipping and logistics process. It essentially acts as a digital broker for carriers around the globe. Instead of a centralized agent for controlling the system, this system makes use of a distributed ledger and thereby brings in a level of transparency and accountability that this industry has never experienced before. All the opportunities mentioned above are being tried and tested by companies around the world as we speak. Now, let us consider some possible implications of the technology that would increase the accountability of financial transactions. Imagine a scenario where every single transaction happening in the world is verified through blockchain technology. Consider the case of elections and every financial contribution made to a politician is verified through blockchain. Knowing where the funds are coming from to fund a politician’s campaign and help him get elected will bring a new level of transparency to the lobbying efforts. There is a lot of scope for developing such applications that can enhance the accountability of financial transactions. A core advantage of developing blockchain applications for encountering everyday business solutions is its transparent and accountable nature. All transactions that occur on the distributed public ledger are secured and encrypted so no one can manipulate the system in future. Entrepreneurs are often found to have absolutely no idea when it comes to understanding and keeping up with industry transactions, but with blockchain applications in place, all of the information can be verified and trusted. As we look to validate transactions using smart contracts, we’re going to see why The power of blockchain technology is so much bigger than its current association with cryptocurrencies. The validation of transactions with smart contracts is one of the examples of the potential of the blockchain to usher in transparency to the system. Blockchain applications can definitely improve the businesses and bring in increased transparency and accountability to their functioning. It is quite unfortunate that people limit the application of blockchain technology to just cryptocurrency. As we discussed earlier, the potential is unlimited. We can expect the popularity of blockchain applications to increase multiple roles in 2019. If you would like your business to take a giant leap forward and adopt blockchain applications to your business, contact Cryptosoftwares today. I hope youu writｅ again soon!